Happy Humpday! Hopefully this week is going by quickly for you! I've been trying to stay away from carbs lately because my DH is on a no carb diet, and so far I've been ok but not as strict as I want to be. For example, right now I'd love to have a nice crusty sandwich but I know it'll be a huge cheat. Diets are no fun! Well, if somehow I happen to come across a sandwich today, I'll try to spend some extra time at the gym today. 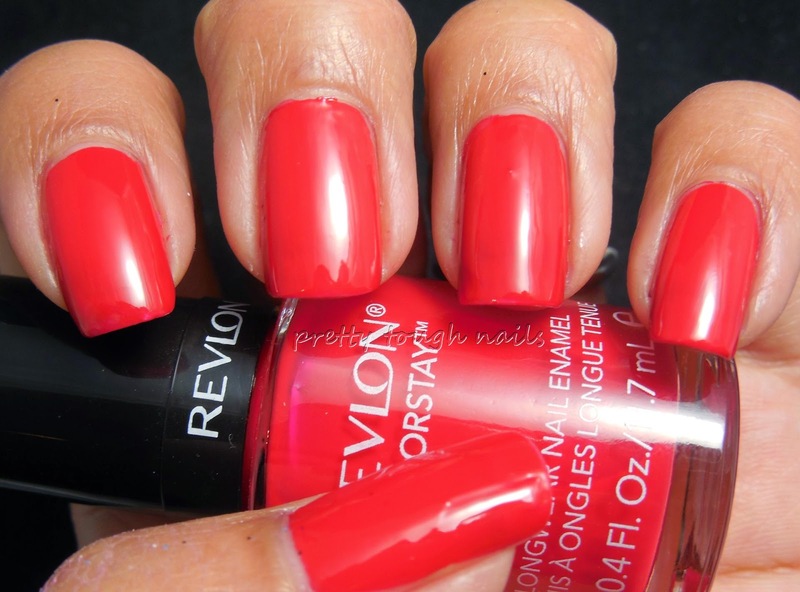 Don't be mad at me but today's swatch is from a line of polishes that aren't available anymore, and that's Revlon Colorstay Red Carpet. The Colorstay line recently was discontinued and replaced by the Colorstay Gel Envy line. Honestly I don't know what the difference is, other than a higher price tag. The colors are the same and they both dry to a high gloss shine. 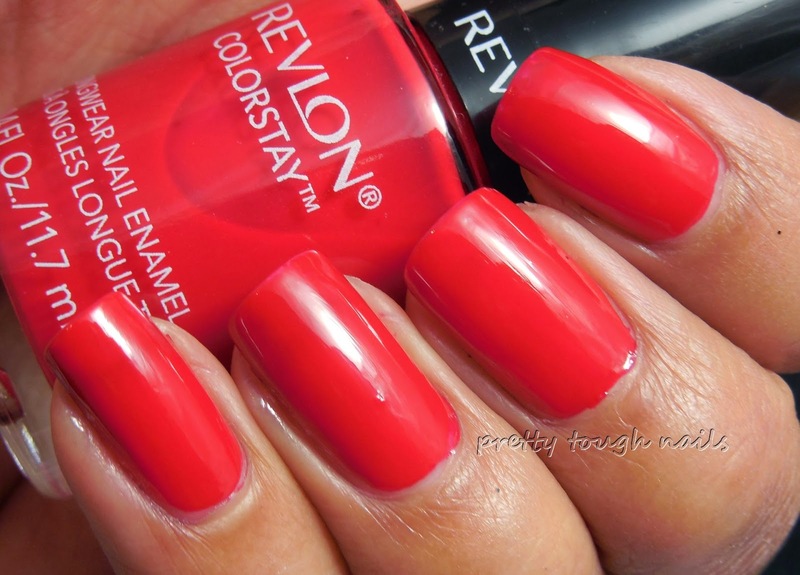 Red Carpet is the bold red of this collection and uses only two coats for full opacity. Unlike typical red polishes, this did not have a strong jelly finish, but rather a crelly finish which I appreciate more(crelly means less VNL). Below I finished with a topcoat, but in all reality it didn't need it - I needed to camouflage some minor dings. A while back I came across a unique dotticure on Instagram, and ever since I've been wanting to try it out. I'm not sure if I did a good job of replicating it, but my hands are too shaky to get those perfectly sized and spaced dots. First I used a large dotting tool to make some black dots down the center of my nail, then connected them with a thin black line using a striping brush. Next I dotted with a smaller tool using GOSH Holographic Hero over the black dots. For these pics, I didn't finish with topcoat in fear that the black would smear, but luckily the nail art did not suffer from any streaks post photos. If you don't look too closely, you won't see all my imperfections. From afar, it looks like a black chain necklace embedded with diamonds. 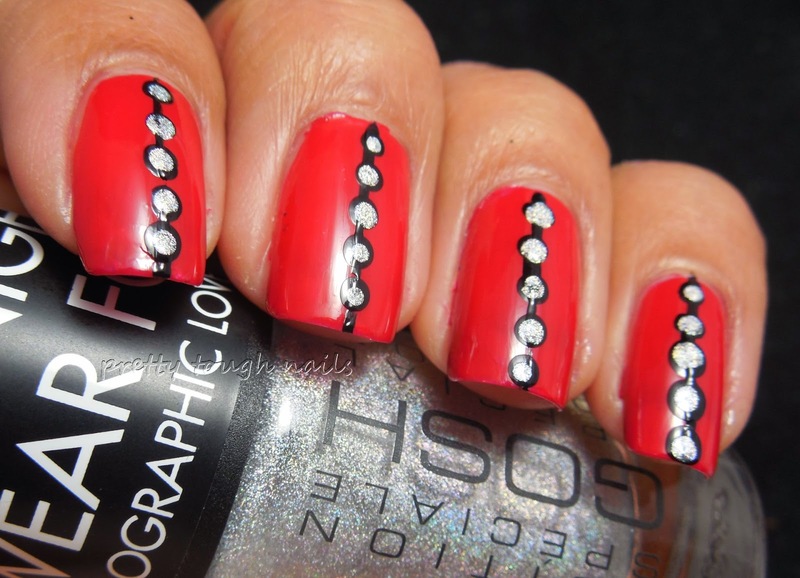 I like how the black and holographic silver accent the bold red color of Red Carpet. It's been a long while since I've done a dotticure, and I have no excuse because they're so easy to do and very quick to finish. I'm liking the shorter red nails for the summer, something I don't often do for some inexplicable reason. Have you grabbed a not so summery color to wear lately? This is such a simple but pretty manicure! Thank you! simple is sometimes the best! 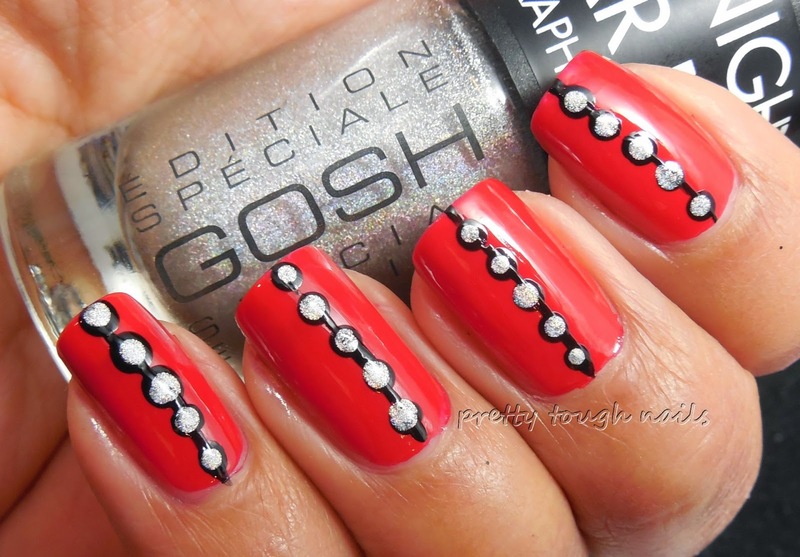 This is a great red on you, love the dotticure! Thank you! You know reds much better than I do. I need to explore this color more! Yep, lol! 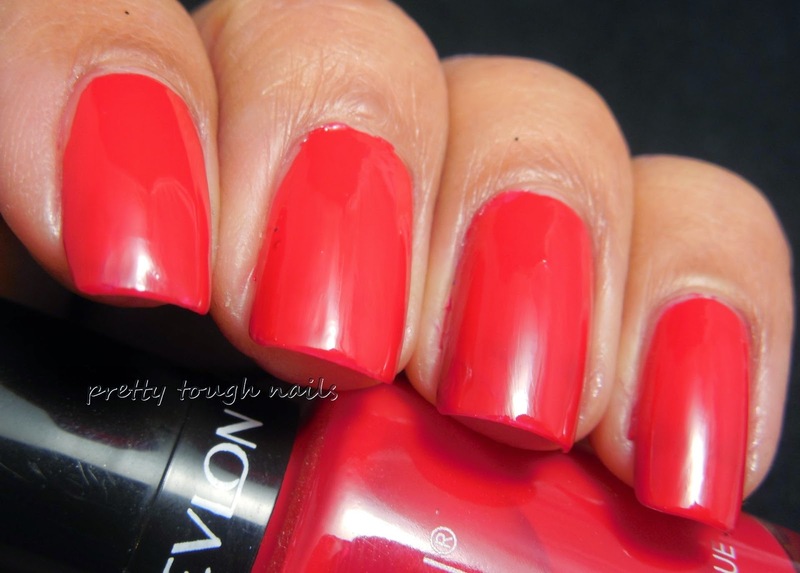 I just put on Revlon Colorstay Bold Sangria and Zoya Payton. I don't stick to any "rules" when it comes to nail polish. If I'm feeling the color, if it matches my clothes or if I just got it and want to see how pretty it is on the nails (like the above polishes), then a painting I will go. How did you like the Colorstay? Are you sad to see them go like me? I don't like to follow rules either, but sometimes I get caught up in the trends. Would love to see how that color combination turned out! I'm a big Colorstay fan. I have a nice collection of them. My Payton and Bold Sangria mani can be found on Instagram. I'm @thelacquercastle. I did the manicure for Purple Out, which is epilepsy awareness day.